↑ 2.0 2.1 2.2 2.3 2.4 2.5 "HORIZONS Web-Interface". NASA. 21 September 2013. http://ssd.jpl.nasa.gov/?horizons। আহৰণ কৰা হৈছে: 4 December 2013. 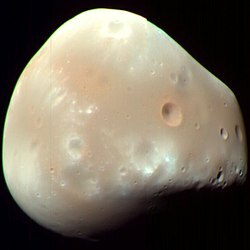 ↑ 3.0 3.1 3.2 3.3 "Mars: Moons: Deimos". NASA Solar System Exploration. 30 September 2003. http://solarsystem.nasa.gov/planets/profile.cfm?Object=Mar_Deimos&Display=Facts। আহৰণ কৰা হৈছে: 2 December 2013. ↑ "Deimos". http://www.seasky.org/solar-system/mars-deimos.html। আহৰণ কৰা হৈছে: June 6, 2014. ↑ 5.0 5.1 5.2 "Planetary Satellite Physical Parameters". Jet Propulsion Laboratory (Solar System Dynamics). 13 July 2006. http://ssd.jpl.nasa.gov/?sat_phys_par। আহৰণ কৰা হৈছে: 29 January 2008. ↑ 7.0 7.1 Blunck, Jürgen (2009). "The Satellites of Mars; Discovering and Naming the Satellites". Solar System Moons: Discovery and Mythology. Springer. পৃষ্ঠা. 5. ISBN 978-3-540-68852-5. ↑ Staff (2016). "Deimos". SeaSky.org. http://www.seasky.org/solar-system/mars-deimos.html। আহৰণ কৰা হৈছে: 23 January 2016. ↑ "Deimos – Viking 2 Orbiter". NASA NSSDC. http://nssdc.gsfc.nasa.gov/imgcat/html/object_page/vo2_413b83.html। আহৰণ কৰা হৈছে: 12 July 2009.